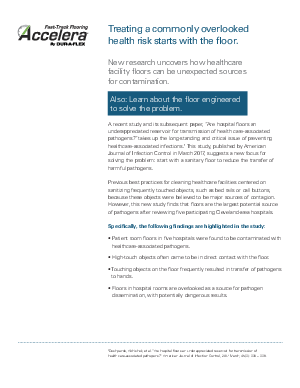 > Dur-A-Flex > Treating a commonly overlooked health risk starts with the floor. Previous best practices for cleaning healthcare facilities centered on sanitizing frequently touched objects, such as bed rails or call buttons, because these objects were believed to be major sources of contagion. However, this new study finds that floors are the largest potential source of pathogens after reviewing five participating Cleveland-area hospitals. • Patient room floors in five hospitals were found to be contaminated with healthcare-associated pathogens. • High-touch objects often came to be in direct contact with the floor. • Touching objects on the floor frequently resulted in transfer of pathogens to hands. • Floors in hospital rooms are overlooked as a source for pathogen dissemination, with potentially dangerous results.